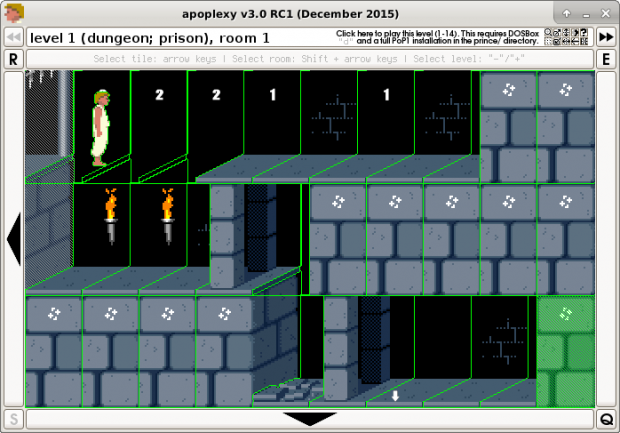 The latest release of the popular mapping tool for Prince of Persia 1 (for DOS and SNES) and 2 (for DOS). This is the - or at least my - final version of apoplexy. It's time to move on. I enjoyed working on the program and I've learned a lot through the years. This program is free software (libre, also gratis), so feel free to redistribute and/or modify it without my permission. * Updated SDLPoP support to v1.16. * SNES playtesting now also skips the main menu. * Slightly changed the Compress() function. * The Windows port is now also 64-bit. - Removed the "AMD64 32-bit" SDLPoP text. + Added support for SDLPoP (v1.16b4). * Fixed two minor bugs (teleport marker, sprite zooming). + The program can now also edit PoP1 for SNES levels!